Water damage is an emergency that needs immediate professional cleanup help. Most professional companies, including TCM Restoration, are on call 24/7 to provide their services when a water emergency hits your Anchorage property. Water damage can come in many forms. It occurs through pipe bursts, pipe leaks, toilet overflows, bathtub overflows, appliance leaks, sewage backups, basement floods, storm flooding, and more. If you need water extraction, drying, cleanup, or water damage repair, call TCM Restoration for a team of trained and certified technicians to help restore your home or business to its pre-loss condition. There are a number of goals to be achieved through the services completed by skilled restoration technicians. Professionals want to make your home or business safe and dry. They want to prevent further damage from occurring. For example, the structure of a home can be damaged by water, becoming warped and weak. It is important to fix the structuring of your home so it stays stable and strong. Professionals also want to make sure that the cleanup process goes smoothly as they quickly, efficiently, and completely clean up after water damage. They want to be thorough during the process and create a restoration plan custom to your property’s needs. The services they provide as a part of cleaning up include moisture mapping, thermal imaging, water extraction, dehumidification, hardwood floor drying, grey and black water (sewage) cleaning and decontamination, complete structural drying, insurance building, etc. Professionals have the equipment, certification, and technical skills that combine into a team ready to be hired to help relieve your water damage burden. 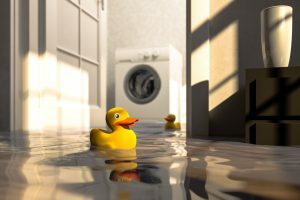 Sometimes finding out you have water damage is an unpleasant surprise, other times flooding and water damage are obvious. Either way, there are some important signs of water damage to look for in your home or other property. Your home should have been built at the highest point of the property so that water flows away from it. Gutters should also be installed to direct water away from the home. If water is not being properly diverted due to faulty gutter/downspout installation or a problem with slope, then flooding and water damage could easily become a problem. Along with these, if the shingles or roofing aren’t in good condition, you could get water damage in your attic or upstairs. Windows and doors should have proper sealing to keep outside elements outside. If the sealing is old or faulty, water could creep inside and cause damage or flooding. Water can also come from the inside. Check for water rings, discoloration, warping, peeling, and cracking on ceilings and walls. These are all signs of water damage. Soft or sagging spots on the floor may indicate water damage as well. Areas around piping and water-using appliances are especially vulnerable to leaking water. Check up on the areas of your home with piping to make sure your pipes aren’t leaking and are in good, fairly newer condition. If you smell something musty or see mold, you likely have a mildew problem coming from excess moisture and water damage. Lastly, keep an eye on your water bills to make sure they don’t spike up. If you suddenly owe a larger amount than usual, you may have water leaking somewhere in your home. If you suspect water damage or know that water is damaging your property, call TCM Restoration for 24/7 immediate assistance.